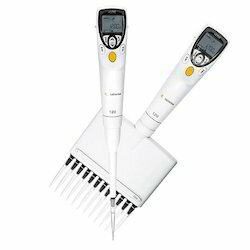 Providing you the best range of tarsons multi channel micro pipette, corrosion coupons, accupipet - variable micro pipette and tarsons vacuum desiccators with effective & timely delivery. Newly introduced from Tarsons with integrated tip ejector. Easy volume setting. Ergonomic design. 32010 8 Channel 0.5-10 l.
32011 8 Channel 5-50 l.
32012 8 Channel 50-300 l.
32020 12 Channel 0.5-10 l.
32021 12 Channel 5-50 l.
32022 12 Channel 50-300 l.
Corrosion Coupons DFT TECH prepare, supply Strip / Rectangular / Disc / Welded Coupons, Stressed Coupons and other range of corrosion coupons test that accurately determine the corrosion of metals in various service conditions. Strip type corrosion coupons are produced in number of sizes, shapes, and material as per customer needs. Corrosion coupons meet NACE Standard requirements and tested before shipment. While ordering test coupons, please refer technical specifications, type of material you are testing, size of coupons, surface finish, mounting holes and locations. Corrosion coupons are supplied in VCI Bags for excellent storage of ferrous and non- ferrous coupons. VCI bags supplied generally protect material up to 1 year under proper environment conditions. Always ensure proper cleaning procedures as given in ASTM-G1, NACE Standards. Note service, initial weights, exposure dates, exposure time, and location for each sample. Record such information on VCI Bag provided . Each coupon is pre-weight before shipment, Ensure once again before exposure and during Pre-Exposure. 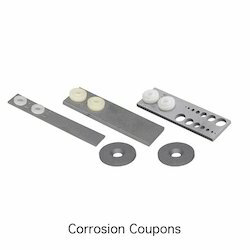 Corrosion Coupons are highly used to monitor corrosion rates in any environment, which is critical when viewed in terms of the maintenance and repair costs associated with corrosion and material failure. Test Coupons are comparatively low cost and effective to measure loss in weight in terms of mils/year to estimate corrosion, important information regarding material life expectancy. Metal Samples can make coupons in any size, shape, or material you need. Coupons can be stenciled with alloy and sequence numbers for proper identification. Mill test reports, identifying element compositions of materials used, are provided on all orders. The simplest, and longest-established, method of estimating corrosion losses in plant and equipment is weight loss analysis. A weighed sample (coupon) of the metal or alloy under consideration is introduced into the process, and later removed after a reasonable time interval. The coupon is then cleaned of all corrosion product and is reweighed. The weight loss is converted to a corrosion rate (CR) or metal loss (ML), as follows: Weight loss determination has a number of attractive features that account for its sustained popularity Simple - No sophisticated instrumentation is required to obtain a result. Direct - A direct measurement is obtained, with no theoretical assumptions or approximations. Versatile - It is applicable to all corrosive environments, and gives information on all forms of corrosion. Reference should be made to NACE Recommended Practice RP-0775 and ASTM G-1 & G-4 for further detail on surface finishing and cleaning of weight-loss coupons Technical Assistance Our Technician and experts can provide technical assistance at the request of customers. Use of corrosion coupon has several advantages as below: No corrosion coupon replacement during the evaluation No maintenance requirements No timetable to accommodate Can be used for all pipes at all flows No electrical requirements No flow rates to maintain or required No equalization period required No big coupon assemblies to install No big coupon assemblies to install For Further details, please contact us. Rugged construction, Extremely smooth piston movement, Autoclavable Tip Ejector and Tip Holder, Easy to maintain. 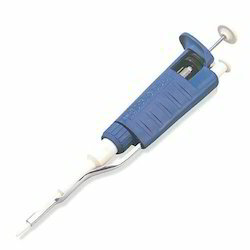 Individual factory calibration certificate with each ACCUPIPET. Bottom made of white Polypropylene, top of clear polycarbonate. With white perforated plate inside. Removable 3-way Teflon stopcock. Silicon rubber 'O' ring fitted on rim for perfect sealing.